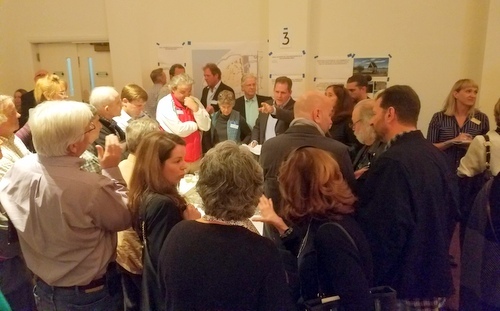 The second of three planned public meetings leading to the creation of the new master plan featured a different, more detail-oriented format than the first meeting in February, which was largely an introduction to the process. On Tuesday night, Audubon Tea Room was divided into five stations where the nearly 100 attendees could circulate for about an hour and ask questions or offer opinions on specific topics — the area around St. Charles Avenue and the jogging path, the area around Magazine Street, the Riverview, safety and traffic, and education and culture. Audubon officials said at the outset of the meeting that no new development on top of green space is currently planned, somewhat averting the conversations about the balance between organized recreation and unstructured open space that often dominate Audubon meetings. Judging by the size of crowds at each table, attendees were most concerned about the Riverview, Magazine Street and traffic issues — and even those at the Riverview table were heavily focused on management of the traffic and parking for large events there, said facilitator Mark Ripple. Many attendees sought new ways to improve traffic flow up on the Fly, debating the merits of one-way or two-way traffic on the road. Others suggested making the large zoo parking lot more attractive to sports participants, perhaps by creating a drop-off area on the Fly and better pedestrian access (such as a bridge over the railroad tracks) back to the zoo parking lot. Some asked for better flow for other modes of transportation, such as bicycles, between the front of the zoo and the Fly, Ripple said. Others asked for better enforcement of prohibitions against parking on tree roots. One contingent asked for repaving of the tennis courts, or perhaps expansion of them, but Ripple said Audubon officials are aware that for every resident who wants more organized recreation, there are just as many in opposition. Based on the concerns expressed both in the public meetings and in the 900 survey responses filled out online, Audubon officials have already decided that hiring a parking consultant to evaluate the entire situation will be a “critical first step” for the park’s future, Ripple said. Another major component of the traffic situation at Audubon is Magazine Street, which subdivides the entire property and can be notoriously difficult and dangerous for visitors to cross. The section of Magazine from Nashville Avenue to Broadway Street has long been slated for a full reconstruction, and that $17 million project is current slated to start in the middle of 2019 in a first phase specifically in front of the park, city officials said at the meeting. During construction, traffic will be reduced to a single lane, likely in an upriver direction, and downriver-bound traffic will most likely be detoured to St. Charles Avenue, said engineer Grayson Fleming. As part of the project, the city is looking at new ways of improving the visibility of the pedestrian crossings in front of the park, Fleming said. Audubon officials also heard suggestions of perhaps adding more marked crossings on Magazine, to slow traffic and give pedestrians more safe places to cross. St. Charles Avenue, by contrast, is actually considered easier to cross, because the neutral ground gives pedestrians a place to stop between lanes of traffic. Michael said the traffic-and-safety discussion included three significant other suggestions worth exploring. One was to extend Leake Avenue into the park’s upriver side, providing an alternative entry point to Magazine. A similar suggestion was to bring Tchoupitoulas Street further into the park on the downriver side, increasing access there. Finally, he said, some people suggested adding paving features that are actually luminous, to improve their visibility. Officials also heard that better signage on Magazine might improve traffic flow, cutting down on drivers pausing to figure out where to turn for the zoo, the golf course or the Tea Room, said architect Tracy Lea, another facilitator. “That seems to be more of an issue than we thought it was,” Lea said. Nearby resident Jack Davis also reminded Audubon officials of an idea floated at the first public meeting, that of attempting to acquire more property adjacent to the Riverview to expand it. Even if the property is not currently offered for sale, Davis said, the idea still deserves a place as a long-term goal in the master plan. “It’s something that probably should not be left out of an aspirational master plan for Audubon Park, even though it doesn’t seem entirely practical to do right now,” Davis said. 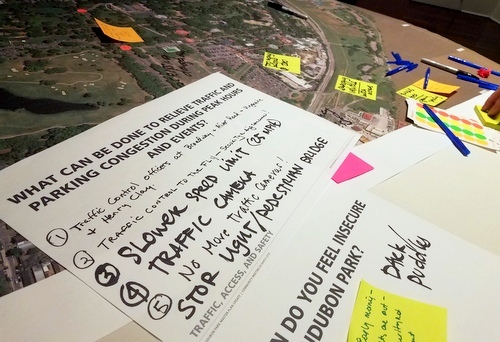 Over the next month, the architects and planners will seek to synthesize the comments received both at the first two public meetings and in response to the online survey at AudubonParkMasterPlan.org (which remains open), Ripple said. At the third meeting, April 5, officials will present a draft of the new master plan for further comment, which the Audubon Commission will then formally adopt at some future point after any further necessary revisions.